“Julie,” he murmured, not taking his eyes from her. “Hello,” she said very softly. “Then excuse me, please.” And casting a glance at Julie, he strode from the room. Julie stared after him. Janet stared back and forth between them. “Maybe you should tell me,” she suggested, watching her friend. Have you met your Twin Flame yet? And if not, do you believe you have one? Such meetings can cause us to throw all caution to the wind. As if sleepwalking, we start to follow this romance wherever it seems to be leading us—regardless of the consequences. Download Your Copy of The Stars Gave Passion! 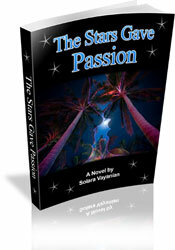 The Stars Gave Passion is also available on Amazon Kindle.